The most notable thing about the Group of Eight Summit in Maryland on Friday and Saturday was the recognition that austerity isn’t a universal cure for what ails the global economy, especially Europe. 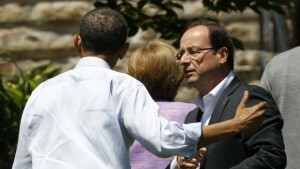 President Barack Obama and France’s newly elected Socialist President, François Hollande, were the rhetorical winners on the weekend. They successfully watered down the German-led position that the best way to deal with a debt crisis is to quickly pay down debt by shifting the consensus to an acceptance that austerity is a means, not an end. Fiscal consolidation remains a priority, but not at the expense of economic growth, a new emphasis that could reshape governments’ approach to maintaining the recovery from the financial crisis. The shift reflects the acute state of the European debt crisis, which Mr. Obama characterized on Saturday as a “serious” situation that could upend the global economic recovery. The G8 also said it stood ready to release strategic oil reserves if crude prices surge this summer, but it was the prospect of Europe sinking into a deeper downturn that most worried leaders. British Prime Minister David Cameron told reporters that he detected a “growing sense of urgency that action needed to be taken” on the euro-zone crisis, Reuters reported. “Contingency plans need to be put in place and the strengthening of banks, governance, firewalls – all of those things need to take place very fast,” Mr. Cameron said. Europe’s economy is stagnant, struggling to avoid recession amidst double-digit unemployment rates in most countries. Britain, which sits outside the euro zone, nevertheless counts the 17 members of the euro region as some of its main trading partners. Mr. Cameron, too, is fighting off recession. His cause hasn’t been helped by his decision to implement draconian spending cuts. Germany is a notable exception, and its economic strength has given Chancellor Angela Merkel considerable clout in discussions on dealing with the troubles in the euro zone. The German formula is simple: sacrifice. Using her country’s own history of fiscal discipline as reinforcement, Ms. Merkel insisted the international rescues of Greece, Ireland and Portugal came with tough budgetary conditions. Other euro-zone countries, including Italy and Spain, have implemented austerity programs to keep nervous bond traders from driving up their borrowing costs. But these programs were implemented in part because Germany made clear it has little appetite for bankrolling more bailouts. The apotheosis of austerity came at the Group of 20 Summit in Toronto in 2010, when Prime Minister Stephen Harper orchestrated a group pledge to halve budget deficits by next year. Mr. Harper insisted Saturday that the Toronto austerity pledge remains valid. The cost-cutting measures implemented in Europe since the Toronto summit caused considerable economic pain, and voters are rejecting the medicine. Mr. Hollande was attending his first international summit after French voters earlier this month rejected Nicolas Sarkozy, who championed austerity. Greece will hold its second election in a month in June after pro- and anti-austerity parties split the vote earlier this month, leaving none with enough support to form a government. The June vote is being characterized as a referendum on Greece’s future as a euro country. Facing an election of his own in November, the last thing Mr. Obama wants to contend with is a rupture of the euro zone, which at a minimum would shake global financial markets. Under Mr. Obama’s guidance at the Camp David presidential retreat, the G8 took the rare step of referencing an outside country by name, saying the group – the United States, Japan, Germany, Britain, France, Italy, Canada and Russia – desired Greece to stay in the euro zone. With a debt well in excess of the size of its economy, and German voters resentful of their taxes being used to bailout nations they see as profligate, it’s unlikely the conditions of Greece’s rescue package will change significantly, if at all. There is nothing binding about a G8 commitment, but countries do use them as political cover back home. European leaders are scheduled to meet in a few days, and it now seems likely that growth initiatives, such as a rumoured infrastructure program, stand a better chance of becoming reality. “Today we discussed ways [Europe] can promote growth and job creation right now, while still carrying out reforms necessary to stabilize and strengthen their economies for the future,” Mr. Obama said at the end of the summit Saturday. Ms. Merkel made the point that governments can enhance growth by other means than pumping taxpayers’ money into the economy. She said measures under consideration in Europe include investments in research and development, Internet networks, and infrastructure. “This doesn’t mean stimulus in the traditional sense,” Ms. Merkel said, according to the Associated Press. There were other hints in the G8 statement about how European leaders will approach debt going forward. The document said the G8 welcomed Europe’s commitment to fiscal consolidation, assessed on a “structural basis.” A “structural” assessment of budgets subtracts interest payments. The decision to write that into the final statement could reflect recognition that much of the pressure on budgets in Europe is the result of record-high borrowing costs. G8 leaders also emphasized their pursuit of “bilateral, plurilateral and multilateral” free-trade agreements, suggesting they will seek to lower trade barriers in any way possible, rather than getting hung up on a big global agreement under the World Trade Organization. The final statement also said efforts to overhaul financial regulations should result in “stronger systems over time while not choking off near-term credit growth,” language bank lobbyists will see as a willingness of by world major financial centres to slow the pace of regulatory reforms. The market rates may have gone down, or remained the same. For the homeowner to get qualified for lower rates, there are certain prerequisites but I would recommend you search online for 123 Refinance before you decide because they can find the 3% refinance rates.